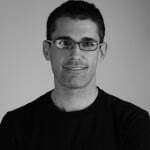 Daniel Lemin is Strategy & Analytics Lead at Convince & Convert. He also runs the consulting firm Social Studio where he provides analytics, PR and integrated marketing strategy to his clients. Agency owners, take note: your traditional team structure – the one that divides your agency into “digital”, “account management” and “creative,” among others – may be restraining capacity to innovate and expand your client capabilities. We work with a lot of agencies and have come to recognize the challenges that leaders are facing in today’s hyper-competitive market. There are smaller agencies that have specialized knowledge in one content area or social technology. There are larger agencies that have built labyrinthine digital teams with varying capabilities, making it hard to assess one agency’s true stripes over another. It’s mind-boggling how much has changed in the agency business in the last 5-10 years and we know how hard it is compete. There are no easy solutions to any of the business challenges and it can feel like you throw good money after bad by chasing new technologies as a service offering. What is the T-Shaped Agency? We have been talking this year about a concept – borrowed from the early years of digital agency business models – we call the T-Shaped Agency. This is a framework for agency owners and leaders to consider as they look to invest in staff education on new technologies, package that expertise into concise service offerings that clients will understand and don’t feel filled with hype and jargon, and – get this – actually deliver on the work in a profitable and consistent manner. How Does the T-Shaped Agency Work? The T-Shaped Agency concept is effective when there is recognition by agency owners that their traditional model of building, pricing and delivering a service to clients is misaligned with the need for rapid and articulate innovation in their client work. Let me build a metaphor for you to frame this concept. Think of an agency as a software package, like Microsoft Office. Clients like to purchase an Office Suite; they know they will need word processing, spreadsheets, presentation software and possibly some other add-ons that make a packaged suite very enticing as a model. It’s fairly expensive to purchase all of this software and not every employee will want or need it, but it provides an easy solution for work productivity. Over time, the need for new features in that software changes and, slowly, the software manufacturer pushes out updates to the software which requires installation and deployment by IT teams and certainly does not put critical new features in the hands of employees quickly. It’s a slow model that does not evolve quickly. Contrast that with newer open-source web-based software services like OpenOffice. These platforms – also available as a software suite, similar to Microsoft Office – provide immediate access to new features and fast deployment of updates without a lengthy installation process. Because it’s based on open-source software, it can take advantage of a community of knowledge – some of which may be very specialized – and new features can emerge rapidly that will be useful to a large number of its customers. 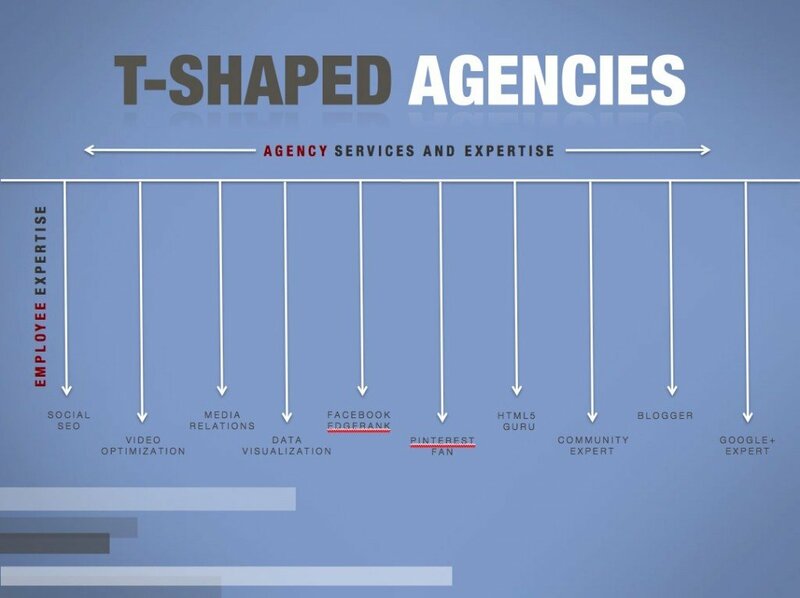 This is similar to the T-Shaped Agency model that we’re describing here. Agencies are filled with vast amounts of intelligence, and while employees may have line-item duties for specific skills – like creative, web development, account management – they may also have a knowledge of a specific technology that no other employee can match. Perhaps they are a weekend warrior on HTML5 development, or a passionate video producer looking for an outlet for their creative talents. The point is these skills exist within an agency and it’s difficult to put a description on them as a service offering; to say you have a video SEO product or a WordPress guru is a bit too specific for most agency engagements. But, clients crave those skills. So you have to adapt your ability to identify who those content experts are and allow them some lateral freedom to put their skills to use. Employees love it because they feel that they’re being valued for the unique insights they have about a specific topic. Clients love it because they feel the agency “gets it” and is able to deliver consistent innovative ideas and actually get them done. Of course, many scenarios will require an agency to look beyond its own walls for specific expertise, but having an internal champion of that technology, platform or concept will still be a valuable asset. How do you go about deploying this structure? It does not have to be a watershed moment. You can start informally surveying employees and asking them what areas interest them. For some, providing a small time or training allowance to bolster their existing knowledge of a topic will be a great incentive. For others, just the chance to show off their talent and contribute to the agency’s success is enough. You can expand the concept by crafting incentives for participation and, slowly, you’ll begin to see a natural evolution in how your teams are thinking about innovation for their clients. Clients will begin to notice too, and they’ll begin to see that your agency is evolving out of the Microsoft Office mindset and adapting an open approach to innovation. Are you using the T-Shaped Agency structure in your business?